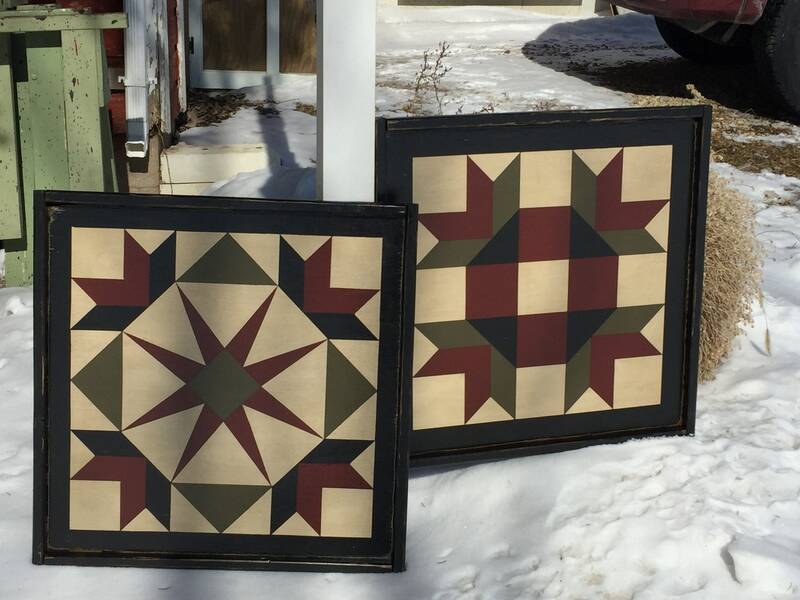 This is the listing for a Set of 2 Barn Quilts in the 2' size! Any two patterns in coordinating colors, or completely different! Choose your own! All of my quilts are hand-painted on 1/2" plywood, using premium Exterior paints with primer, then are distressed and stained to achieve that aged look. They are finished with 2 coats of exterior Varathane. These sets of 2' Quilts have a 3/4" pine frame attached to the edges of the quilt. (See last photo for close-up example of frame style) The finished size is roughly 25 1/2" X 25 1/2". A Set of 2 quilts in the 3' size as well as a Mixed Set of 2 (a 2' and a 3') are available in separate listings. The quality was very good and the product is awesome. I received the item before the estimated date and the packaging was outstanding. This is a quality company that has excellent service. The items made the difference needed to our barn.